(From top left) I made another batch of Tanya Burr's cookies on Monday. A small shopping haul on Tuesday to celebrate finishing university. I got tickets to see Wicked and oh my goodness it was amazing. It was my mumma birthday last week but I finally got to see her and give her some presents. The first week of my summer holidays has been a busy one. In the pouring rain on Monday Eilidh and I went out to sign the lease for our new flat - we move in on the first of July. In the evening I baked some cookies and we bought tickets to see Wicked at His Majesty's Theatre Aberdeen for the following day. I was so excited I could barely sleep but on Tuesday I got up to go shopping. Had a nice time browsing in town and picked up a gorgeous bikini in primark for my holidays. The photo album was from paperchase and they are my favourite just because of their quality. Finally 7:30pm rolled around and we were waiting for Wicked to start - I went with my flatmate Eilidh and her mum. We were so high up in the theatre (in the cheapest seats) but our view was reasonable. It was so so so so good. A musical I've always wanted to see and it didn't disappoint in the slightest. Gives me goosebumps just thinking back about it. On Friday it was time to move out of student accommodation and my parents came up to help me pack. It was exhausting but we eventually got everything in the car and home for summer. It was the weekend of my town's music festival 'MoFest' so I went to stay with Scott and we went to listen to music in the sunshine on the highstreet and in local pubs. It was so good because everyone is happy and chatty. Unfortunately though I might have hit the alcohol too hard and was very very very sick most of Sunday... oops! I do feel like I ruined the day but maybe it was worth it for the fun we had on Saturday? 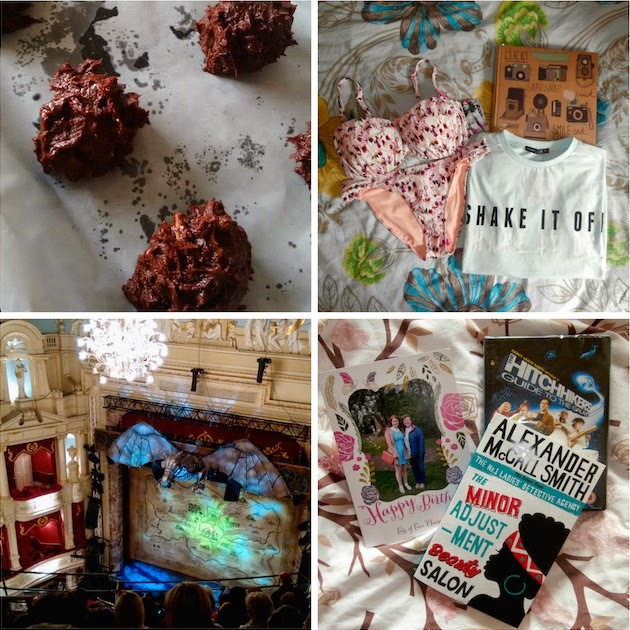 I am now only 10 bloglovin' followers away from my next milestone! So if you stop by this space often give me a follow here and help me reach my target. Your week looks positively dreamy! Those cookies are making my mouth water a little, I think it's time to go and find something sweet in the cupboards or whip something up too. I'd love to go see a proper show like Wicked! You lucky lady! I hope the move in to the flat goes well. I must go and see Wicked very soon!!!!!!! !